Maple City, Mich.- The Leelanau Conservancy’s new three-mile mountain bike trail at Palmer Woods Forest Reserve has officially opened. 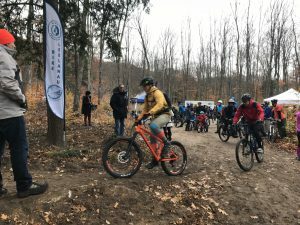 Close to 150 people attended an opening ride & party on Sunday, November 4th in cold, wet conditions to ride the first public, flow-style mountain bike trail in Leelanau County. “We’re overwhelmed by how excited people are,” said Cody Sprattmoran, Co-Founder of Bike Leelanau and board member of NMMBA. 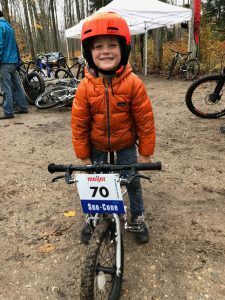 “We saw so many families and lots of smiling faces coming off the trail.” A local Bike Shop, Suttons Bay Bikes was also at the opening ride event offering free demo bikes for people to try. After feedback from the riders and a post-ride inspection, there are several areas along the trail that are still under construction. Mountain bikers should use caution and be aware of any construction areas as the finishing touches are made to the trail. “This is just the beginning. The enthusiasm from the community was palpable at the opening, and got us really excited to add another mountain bike loop at Palmer Woods next spring,” said Nelson. Leelanau Conservancy is a 501(c)3 nonprofit land trust that conserves the land, water and scenic character of Leelanau County. One of our 26 natural areas open to the public, the 721-acre Palmer Woods Forest Reserve is a four-season recreational destination located in the heart of Leelanau County. In addition to mountain bike trails, Palmer Woods has seven miles of hiking and groomed cross-country ski trails for the public to enjoy. Rode the trail on Monday; a great addition to the local trail systems because of its’ unique qualities. Thank you and keep up the good effort! Where can I get a good map of Palmer Woods trail??? How many miles of trail are planned? At this point we are planning for 6 miles of trails in this phase. I look forward to trying out the new mountain bike trail! Will the trail be open for riding this winter? If so, how can I find out when it’s OK to ride it (based on temps, snow conditions, etc.)? Hi Bruce, the trail is closed for riding over the winter. Since it was so new, we want to avoid any degradation or damage to it that could happen with riders during the freeze/thaw cycles. We will be reopening the trail in the spring!